Tacos were not on my food radar when I was an Italian-American kid growing up in Brooklyn. But I did start eating them after moving to the Midwest and became a fan before my angioplasty took Mexican dishes largely off my post-surgery eating menu. I missed tacos, they remind me of fun meals I used to make with my kids, and so I was very excited to see that Mrs. 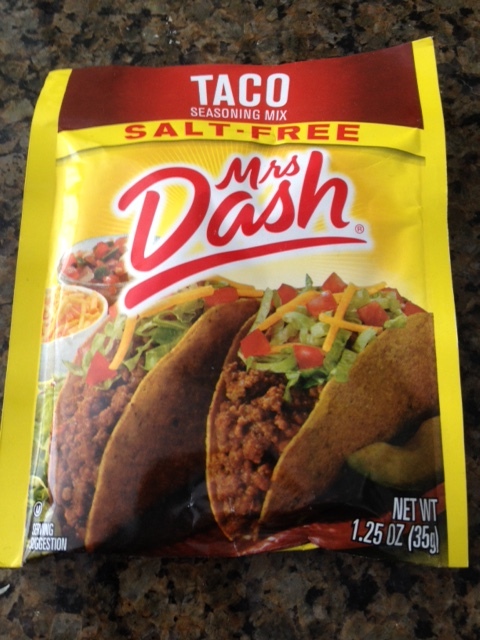 Dash makes a salt-free taco seasoning mix. You can see the nutrition information here, no salt, some sugar according to the ingredients list but not enough to put on the nutrition panel, and potassium chloride used instead of salt, or sodium chloride. If you have any potassium issues, you might want more information about how much is in this. But if not, this can be a first ingredient for some relatively low-salt, low-fat tacos. I originally thought I’d use it with ground turkey as a lean protein source but then in comparing fat levels, I discovered that the 96% lean ground beef I buy has less fat than some ground turkey available. Four ounces of the 96% lean ground beef has only 4.5 grams of fat compared to 8 grams for one variety of ground turkey I had on hand, so I went with the beef. 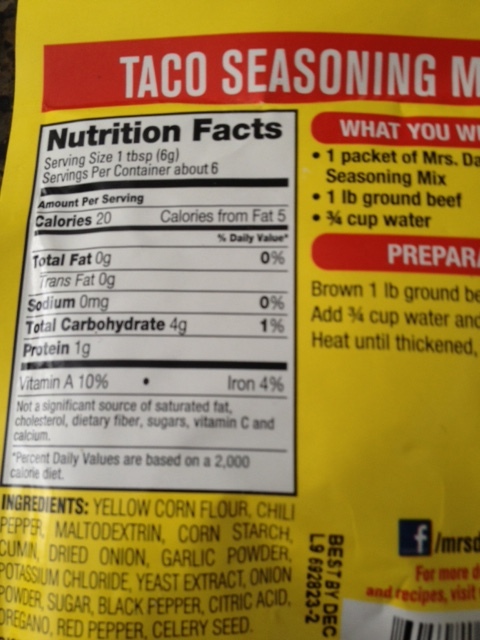 But I still needed to track down other key ingredients in low-fat, low-salt forms, salsa and taco shells. Read how I did that in my next post.